The hall of the Palace of Culture and Science of Novokramatorsk Machine Building Plant for 900 people was packed to capacity. Besides the most important and enjoyable football-awarding event, the organizers have prepared a celebratory concert for the young football fans. FC Shakhtar Fan Liaison Unit Head Andrii Hladchenko and NKMZ PJSC Deputy General Director for Economics and Finance Yurii Boyarskyi wished the children a Happy New Year and gave them presents. It is worth noting that not a single participant in the Come On, Let’s Play! 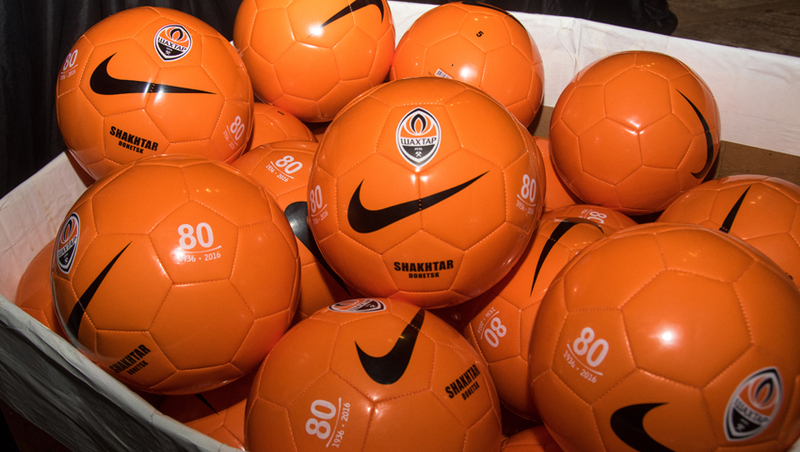 project in Kramatorsk was left without a Nike ball with the club crest; even the administrators, coaches and volunteers received the footballs. The project was launched in Kramatorsk in the summer 2016, involving over 300 kids. Shortly, they will hand gifts to the Come On, Let’s Play! project participants in Kurakhove, and then in Donetsk.